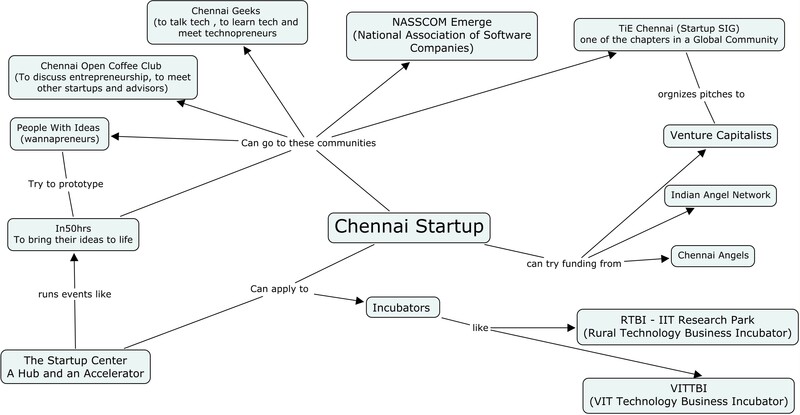 Decided to take a shot at mapping the players in Chennai Statup Ecosystem. Let me know through comments whether I missed out anything important. This is clearly work in progress. Expand the work of each player (attach a document) and link them to their websites/facebook pages. So will the next generation of news sites have more interactivity? Will they let you get to the underlying data? Will they make it link to news and opinions related to other news sources? What happens when the underlying data behind a news item becomes visible and powered by tools like the debate graph? In50hrs should really be called Under 50 hours 🙂 It is amazing to see what can be done in 50 hours or less. I was at the final presentations and was impressed by the type of projects, the quality of prototypes and how well each team articulated their vision. The feedback and enthusiastic questions from the audience was great as well. The Startup Centre provides a place where people can go and rub shoulders with others on a similar journey, entrepreneurs and mentors. In this event called in50hrs, they pitch their ideas, bring them to life through a simple functional prototype. Then they show, pitch and get feedback, questions and suggestions. Each item of feedback, or question increases their own knowledge. They can take these suggestions and go to the next step. As an entrepreneur, I am proud to be part of this effort. It is nice to watch the community grow. For many participants, it is the first time. A few mentors like Sid and Kausik dropped their mentor roles and jumped into prototyping their ideas as well. It was a great event to be part of. Every year, it gets a little better. And this year is one of the best. OfficeHours – A kind of an expert exchange. You declare your expertise, specify how much time you can spend helping others, accept meetings/chats/hangouts and help out. This was an idea conceived a couple of weeks ago in Chennai Open Coffee Club by Ashwin. WebTrails – a fascinating tool that lets you follow other people’s trails. You can create your own. Sequence – a tool to help you in marketing by understanding customer behavior on your site. Card.li – a product that lets you communicate with short visual messages. May replace email for quick bursts of communication, notification. A streaming media player built using Raspberry PI by three students from SSN college. They walked in with a different idea and had no knowledge of Raspberry PI but quickly changed and jumped on it. The event ended with a couple of presentations from Silverstripe Software on their TourMyApp and Eventifier. Both made considerable progress since their prototype. It is nice to see prototypes turning into MVPs (minimum viable products) getting some traction and users and potential customers. Hope to see more of these in future events. There is a lot of promise in these ideas. What, as a community can we do to help them? I have known Suresh for over 4 years. We hang out together in Chennai Open Coffee Club, TiE, NASSCOM events and coffee shops. He is the kind of person, I would like to have beer with. We chat about industry, companies, growth, marketing and many things entrepreneurial. It is always a pleasure to spend time with Suresh. He is one of the most positive jovial persons I have ever met. OrangeScape is one of the most promising technology companies in Chennai. They build cool stuff and are continuously innovating. Suresh has a great team. His core team members like Mani Doraisamy and Dinesh are big contributors to tech ecosystem in Chennai. When Suresh agreed to do this interview, I was really happy. I think I caught him at the right time. He is back from US for a short while after a product launch and heading back again in a month or so. So here is Suresh, definitely a source of inspiration to many of us, his fellow entrepreneurs. I started my 1st company with 4 other partners in Cuddalore ( my home town), way back in 1993. I was 20 years old and just got out of school. It was driven by my passion to work on computers and not about making money nor changing the world. We had to close that company (SISS) and I decided work in a corporate environment to understand “business”. Luckily for me I landed in Hewlett-Packard. It was intrapreneurship while I was at HP and it was intrapreneurship++ when I moved to Selectica. I quit Selectica in 2003 to create OrangeScape. Thinking about it now, I feel that there was a streak of entrepreneurship in me. OrangeScape PaaS is targeted to mid to large enterprise customers with $500m+ annual revenues and have an established IT team. OrangeScape’s KiSSFLOW is for Google Apps Customers and targeted towards “process owners” across various departments to build workflow in do-it-yourself style. Technically, our first customer is Numeric UPS, India’s #1 UPS manufacturer. I owe a lot to Mr. Chellappan, MD of Numeric UPS, for the trust and confidence in us by granting the 1st order worth more than US$25,000. However, the one that I am most proud of is the deal we closed with Chennai based auto parts manufacturer with 1000 crores of revenue – RANE Group of Companies. Unlike Numeric’s order, which came through personal relationship, this one was hard earned through sales process that too my 1st deal and it was for US$23,000. Entrepreneurs tend to be natural salespeople and marketing is a discipline that appears as if you know it, but there is a lot to learn in marketing. In this digital age, mastering marketing is key to success. Hence I believe “Marketing” in a big way to our “target” audience with the financial constraints we have, is the biggest challenge. How do you interact with your peers (both offline and online) ? Do you have mentors or coaches? I read a lot of blogs of peers and thought leaders. I am a heavy networker and I regularly attend TiE, Chennai Open Coffee Club, NASSCOM and other local events in Chennai/Bangalore. My first mentor is Mathiazhagan S, my manager at HP and then Ayee Goundan my boss at Selectica who was/is my mentor, coach and more. Half of the professional management skills I have today, I learned by working with Ayee. I owe a lot to him for what I am. Ayee is also the 1st investor in OrangeScape. What lessons have you learned that you would like to share with others? In my early career, or even as recent as 4 years ago, I thought “Technology” is the greatest thing. I am a changed person now. “Marketing” is the ultimate thing. With “marketing” one can conquer the world. Good technology is definitely needed but it is “Marketing” that makes good technology’s worth felt. Hence, I request young entrepreneurs to invest in “marketing discipline” (don’t mistake it for marketing activity). This is so important that you can’t delegate and hope things will fall in place. Remember, marketing decides the fate of your company. Suresh is in Chennai for a couple of weeks. I know he is always happy to talk to entrepreneurs. If you have any questions related to Cloud Space, you can either leave a comment in this blog or contact Suresh. I first met Chandra some time in early 90s. But I really came to know him through a mutual friend in US. After I started visiting India, I used to call Chandra and have conversations. I still recall Chandra saying “every day I go to drop my kid at school and see several parents. I am sure that we may be able to help each other some way in business”. I guess he has been thinking about this for a while and probably one idea led to another and Yokibu was born. What inspired me to become an entrepreneur? It is a very difficult question to answer. I cannot say that just one thing made me do what I am doing now. It is partly because of my personal nature of not worrying too much about the outcome of an effort and my restlessness in continuing the status quo. But certainly my job at USA was the catalyst. I moved to USA in 1995, the beginning of the dot.com era and I found companies being founded with so many ideas, some obviously trivial. I guess I was influenced by the positively charged entrepreneurial atmosphere. The other reason could be the fact that I was slowly getting tired of pure coding. At the same time I was also getting attracted to brand building. I was excited about how brands are created and registered in the minds of people. My idea of a startup was to build a product or service or platform that serves consumers at large and creates a lasting and trusted brand. I am glad that whatever I am doing now is slowly but steadily getting there. What products or service do you provide? Yokibu.com is a specialized portal connecting schools, students and parents. Our first paid customer was not someone that we actively targeted or planned to signup. As our online community grew, we had a few opportunities that came our way. Some of our members were employees of a few known brands and they wanted to promote their brand to our community members and we did get paid. 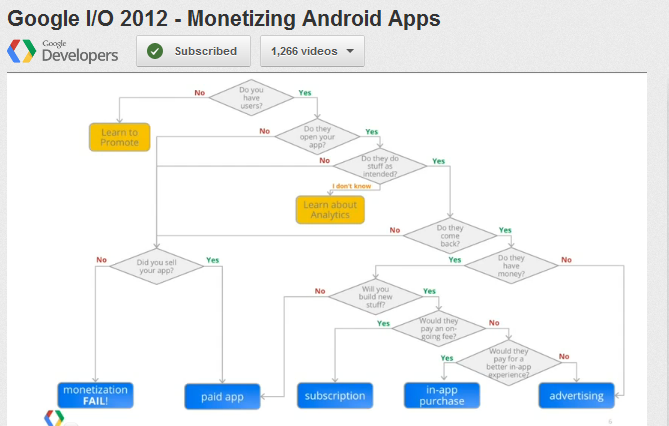 This would generally fall into the AD revenue category which was not our core focus. However, a payment by one of our members from our planned online e-commerce service is what I would call as our first real revenue. This happened after we launched our beta online e-commerce service where the parent paid for an offline class online on Yokibu. The irony though is that he couldn’t pay online through our platform as we had not yet enabled net banking for the bank that he was a customer of. So he had to do an online transfer to our account directly from his account. The trust that we had built with our customers was so good that he was ready to take our bank details over phone do a direct transfer. We have many challenges. For example, when we started, the schools were not yet ready to embrace technology the way we envisaged. But we persisted and it is paying. Funding was and continues to be a huge challenge. In businesses of our nature where building a community requires considerable period of time (especially in India) and the revenue model is not yet proven, the Indian VCs (unlike US VCs) tend to wait and watch until the model is proven. In my opinion Funding at the right time can actually make a business successful. I have no specific mentor. But I seek guidance from many people that I interact with and trust as and when required. What lesson have you learned that you would like to share with others? No matter what your idea is, you need to find out how the business is going to generate money first. Once you figure that out, you need to then find out how and when to be profitable. I met Srikanth in TiE Chennai and Chennai OCC. We chatted a couple of times. I introduced him to one of the most valuable marketing experts in Chennai – JK Iyer. In one coffee session (remember it being Barista in Khader Nivas Khan Road) that lasted a couple of hours, I listened with fascination the story of Funds India. When I requested Srikanth to answer my seven questions, he readily agreed. Here is his story. Enjoy. To a certain extent, I can be called an accidental entrepreneur. I was not planning on starting a company when I did (with my friend Chandra, in late 2008). It was a case of an opportunity meeting a latent desire. I can trace back the desire to become an entrepreneur to, as many in my generation will probably do, the dot-com days of late ‘90s. I started my career at IBM and worked there for five years, and when I tired of that (and had secured my green card 🙂 ), I moved on, through a referral, to a start-up company in financial services field. Looking back, this move appears providential – it both sparked my interest in start-ups as well as started me off in financial services. Working in this company – FolioInvesting.com – opened my eyes to the possibilities and the excitement of creating a product/platform that would be used by thousands of people. This is a common-place feeling today – in the days of personal blogs with thousands of readers and followers – but 12 years back, it was quite exciting to be directly part of a team creating a tangible, visible product that is being actively used by a lot of people. Although, I moved on from this firm into another large firm, the desire to get back to starting up – to create something, own it, and be responsible for it – was always there. So, when I came back to India in middle of 2008, my friend of 20 years, Chandra, and I started exploring possibilities of creating a financial services platform in India. He was a very seasoned entrepreneur (both in US and India), and so I knew that this was an opportunity that does not come along very often in life – an opportunity to work with someone I completely trusted, in a domain of my liking, creating a product in an under-served market. And FundsIndia was born. We are FundsIndia.com. We are an online financial services platform, specializing in mutual funds. We are a transactional platform – meaning our platform enables people to transact with real money, make investments in different ways, and manage it efficiently. We are partnered with 38 mutual fund companies in the country and with 33 banks for online net-banking transactions. The cool thing about our platform is that we offer technology enabled features for mutual fund investing that are not found in any other platform in the country. There are many people/platforms that will sell investors mutual funds, but none of them specialize in it the way we do. For example, one of the most favorite method of investing in mutual funds is through the mechanism of systematic investment planning (SIP). While mutual fund companies and other platforms allow you to do SIPs, we offer seven different ways of doing SIPs – all simple variations that enable people to either invest better, more flexibly, or more profitably. We are able to do it only because of our technology and business of scale. This is just an example – there are many such new methods of investing that we have created that make investing either easy, flexible or profitable for our customers. Also, we enable people to manage investments of multiple family members within a single login id. Typically Indian families invest in the names of their spouse, kids, or parents, and with a single FundsIndia login, they can all be made and managed in one place. We also offer other financial products such as equities (stocks), corporate fixed deposits and online-enabled NPS on our platform. Our customers can be anyone who is saving and investing for their future. If they are comfortable with online banking, they are potentially our customers. Another way to look at it is if they are a customer of an eCommerce site like FlipKart, they are probably our customer as well (so, can we get similar valuations, please? 🙂 ). Typically, our target customer tends to be in early thirties working in a new economy corporate job. However, we have customers from across the country as young as 23 to as old as mid 60s. The first customer that I remember was a gentleman from Pune. We had just launched our service, and had small press clippings about our press conferences. This gentleman, whom I have not met yet, opened an account with us, and started small investments. We were thrilled to bits to get the first ‘stranger’ customer. But we were really surprised by what he did soon thereafter. We were yet to carry HDFC mutual fund on our platform, and this gentleman wanted to invest in a HDFC fund. He simply sent us a cheque for Rs. 5 lakhs and asked us to please make the investment and move it over to his account once HDFC comes on board. That told us two things – it validated our assumption that we were going after a good, under served market, and it also reminded us that we are going to be keepers of trust from every one of our customers. The trust and confidence shown by this customer was humbling, inspiring, and gave us a sense of responsibility that no amount of words could have. When we started our business in the mutual fund industry in India, we did not know that we were entering the most interesting period in the history of the industry. Since 2009, when we launched our platform, too many things happened on the regulatory front. Most of it was to our advantage from a business stand-point, but they introduced a sense of constant change that we had to be always on the alert for. Even today, there are changes afoot in the industry, and we don’t know how much of our attention will be diverted in dealing with that. So, regulatory changes and dealing with them in context-switching, hurried manner is our top challenge. Apart from that, by very nature of our business, we have some challenges. We intermediate between retail customers and many dozens of financial institutions – mutual fund companies, banks, payment gateways, brokers, registrar and transfer agents, corporate fixed deposit houses, data providers, research firms etc. Enhancements to our platforms, in most cases, need help from one or more of these entities, and the pace of progress can be quite frustrating at times. On the internal front, hiring good people is always a challenge. We have a core group of very talented people and have very low attrition (knock-on-wood). However, trying to grow the firm with good talent is not easy. Especially on niche technology areas like mobile development, and in senior executive positions like product and marketing management. I am lurker in many online groups – both locally in Chennai and outside. Groups such as Chennai open coffee club and larger entities like TiE are very useful as steady points of contacts to keep in touch with fellow entrepreneurs in the area. Outside Chennai, I try to keep up to date using Twitter and Reddit. Also, the board members from our VC investors are very helpful getting us in touch with important, useful resources that would help us. Although I can talk of several here, let me just focus on one thing. When starting a company, the founding team will rarely have the complete set of skills that will be required to run the business. The team would need to realize this early, and address it aggressively as soon as possible. We learnt this lesson the hard way in terms of the need for marketing skill. We were in a retail business, and the need for marketing was paramount. I think we postponed the decision to get external help on this too long and that lead to an inefficiency of our spend, especially in the early months of our business. So, it is important for businesses to realize which vital area they are lacking in talent/experience to run their business and address it explicitly and quickly. We were trying to create a directory of Chennai companies. Srikanth took it upon himself to register a domain name, create a wiki and move the list from Facebook to the wiki. it is open and any one can register and add their own company. Take a look at Chennai Startups. Silicon Valley is not a place but a State of Mind. It is good to read what Vinod Khosla thinks about the Silicon Valley Vision. I think this is the essence of entrepreneurship too, no matter where they are. If you can celebrate these attributes, recognize them and encourage them, you can start building a culture of innovation and entrepreneurship and help create “the state of mind”. 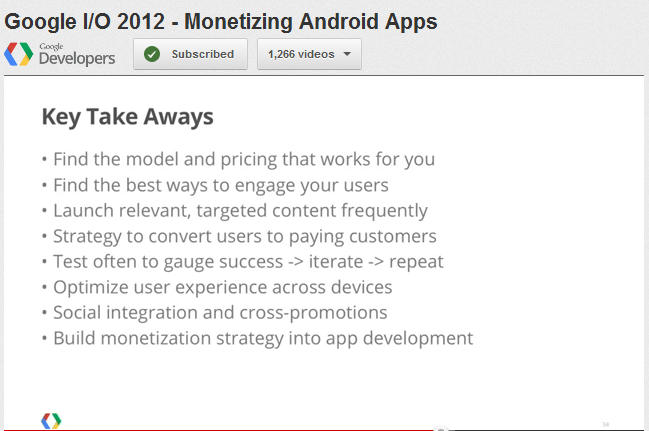 I was watching this Google video on Monetizing Android Apps. Here is a little teaser for you to go and watch it. If you are new to building Android apps, this session is a good one to watch. 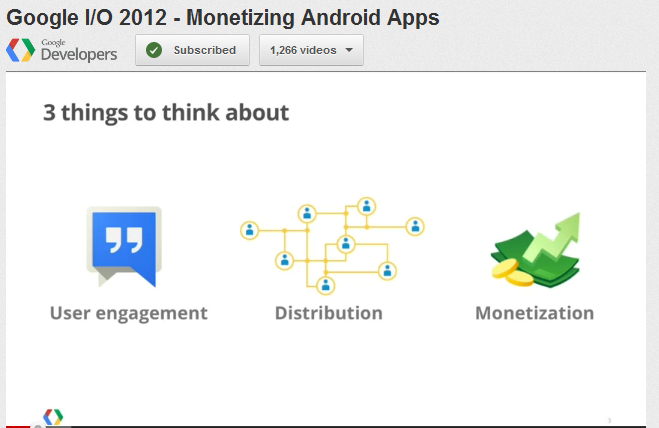 It starts off talking about 3 things you need to think about – user engagement, distribution and monetization. The concluding slide on Key Take Aways gives you some good tips. App Stores, Directories, business models are in their infancy. We will see many innovations in this space. I am going to watch a couple of more videos mentioned during this session. Today’s mobile applications are making computing “personal” as never before. Today, we carry computers with us constantly, as smartphones and pads and the new devices that are regularly emerging. More significantly, today’s personal computing is increasingly “about” us: where we live, where we work, who our friends are, what we buy, what we like, whom we talk with, and what we talk about. This personal computing is linked to global data services and information sources in a way that fundamentally transforms our experience and our perception of our world, just as television did for people beginning in the 1950s. Whether this will happen or not, only time will tell. It will be an interesting decade for non programmers to personalize their little mobile computers (phones and pads).